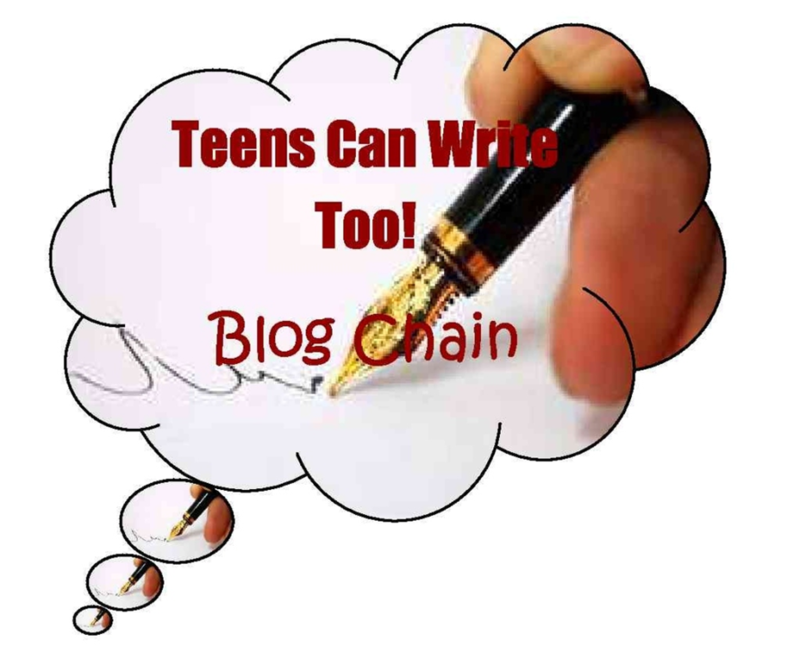 Today, as part of the Teens Can Write, Too! blog chain, I’m writing a post based on the prompt: “What is the first thing you remember writing of your own accord?” I urge you to read other posts on the chain – I had the hard job of starting, and I’m sure they’ll all render me insignificant as soon as they post! All the details are on this page. Just recently, on the internet, I’ve started using my real name, or part of it, and calling myself Miriam Joy. That’s the name I plan to use if I get published, and the name that I use on YouTube. But for several years now, I’ve been using the name ‘delorfinde’. There are variations – “Delorfinde”, “delorfinde”, “delorfilinde” (which is actually the full version), “Delorfinde Mairim Telcontar”, “Delorfinde Aniviel Telcontar”, “Delorfinde Telcontar”…. the list goes on. But that’s the name I’ve been using. I think the first website on which I ever used it as a username was Runescape, if you know what that is. I may be wrong, but that’s definitely the first one. Later, it became my handle on Elfwood, Protagonize, NaNoWriMo, WordPress, YouTube… There came a point when I was so used to being called ‘Del’ that I started signing emails to teachers like that, much to their confusion. But where did the name come from? I generally say that it came from a story I was writing when I was nine or ten. This isn’t true. Sometimes, I’ll tell people that it was a name my sister gave to me, my ‘Elvish’ name. This is true, in a way. But really, it came from a play. It’s funny that I should be given this prompt now, because I actually found this play in a pile of papers on Tuesday of this week, and it’s beside me as I write. It’s called ‘Escape!’, and the version I’ve got here – I believe I was nine, although I was younger for the original – is written in the font “Papyrus”. Ouch. And so it goes on. What most people find interesting about the play (besides how bad it is) is how many times I reference The Lord Of The Rings. Hey, I was an educated kid, I’d read it by the time I’d been eight for a month. This play turned into a story. The story turned into a book. It became my first long term project, and I have to say that I also found the story the other day, too. Then I found the ‘book’, or several copies of it. Printed manuscripts, three different versions, covered with edits. Lovely! By this time I was ten/eleven, and in Year Six at primary school. I spent hours and hours on it! It was my masterpiece, the thing that was going to make me famous, and by the time I stopped working on it, it must have been thirty or forty pages long! What? They tell you to recycle things to save trees. I didn’t need it. Hell, the thing never even got a proper title – look at that edition on the left. I experimented with so many, and edited it so much, and none of that changed the fact that it was an unoriginal, unbelievable story written by a 10-year-old. But it was the first story I actually wrote. That play was my first foray into creative writing outside of the class room. Oh, I wrote loads at school, and got several ‘head teachers awards’ for my writing (I could get away with copying the plot of LotR, since my teacher hadn’t read it), but I never wrote outside of school. Not really. Not until then. I’m not even making this up. Here’s an older version, not written in Papyrus, with my name at the top in proud highlighter. You know, I made my friends perform this. Nowadays, I look at that play and think, Oh, man, did I really write that? But the same’s true of the things I wrote a year later. Two years later. Three years later. I look at them now, and wonder what on Earth I was thinking. I gave a session at a Creative Writing Club that I help to run, and told them all about e-publishing and how they could go out and publish their stories now but they shouldn’t. What was my reasoning? Well, they’re twelve years old. Thirteen at a push. When they’re fifteen, sixteen, twenty, they’re going to look back at their work and wonder if they really wrote that. I know this because I’ve done it too. Even now my sister warns me not to be too proud of my work because I’ll hate it later. And I’m not saying everything you write is terrible, I’m saying that there is a difference between believing in yourself, and refusing to see what’s wrong with your story. Most published novels, ‘debut’ novels, are not the first novel the author wrote. Why? Because they improved. 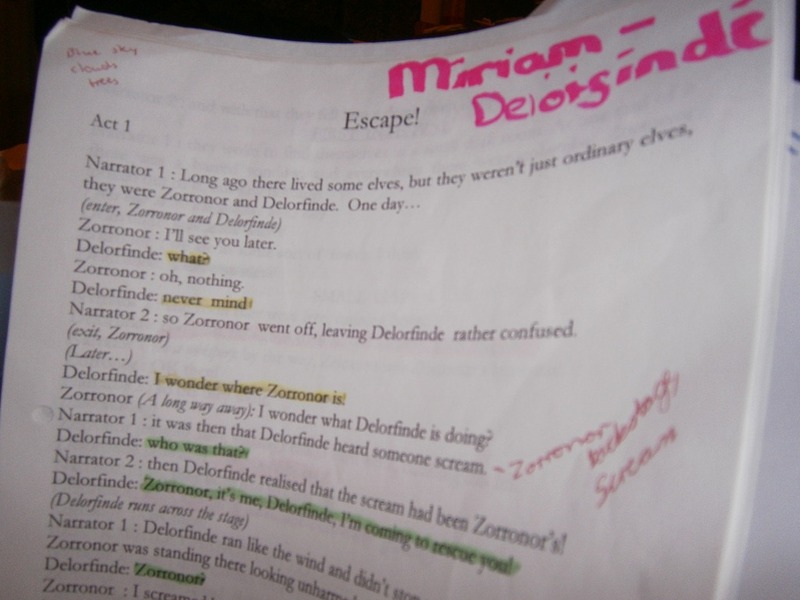 And yeah, when I was eight, that play was amazing and I couldn’t understand why my friends were so reluctant to act out the other parts for me (especially Zelcanva, who doesn’t even appear for several pages). And when I was ten, that story was amazing and was going to be published. 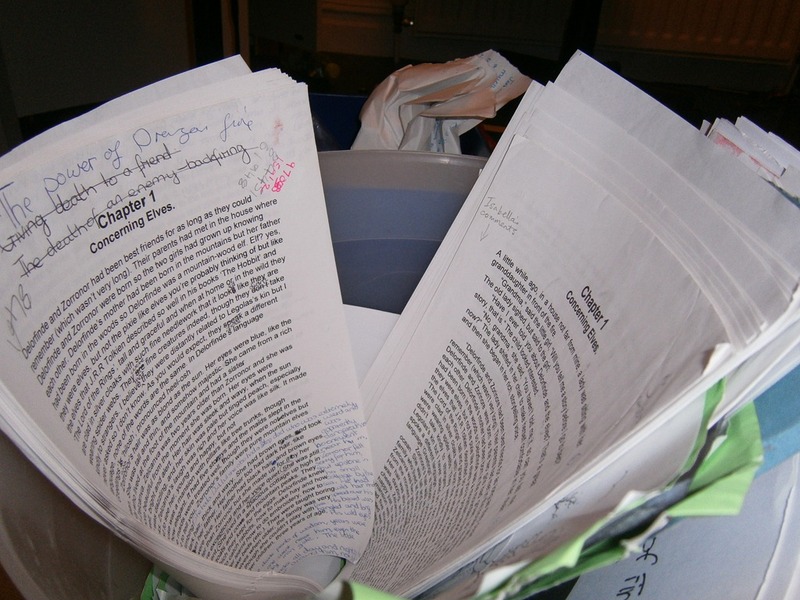 I have files in my computer from when I was eleven, twelve, thirteen, optimistically labelled ‘stories to publish’ or ‘best ever stories’. They’re terrible. But everybody has to start somewhere, right? PS – The ‘book’ version of Escape! contained a fantastic death scene, though I say so myself. Delorfinde had her throat ripped out by Zorinore (yes, the spelling changed) in her werewolf form! Isn’t that the best thing for a ten-year-old to be writing? Oh, and don’t forget the vampire, Shem. And the dragon that eventually brought good ole Delorfinde back to life…. Yes, it was on Protagonize. I posted it in a collection of things that were written as children, as to this day I’m still actually pretty proud of it. I always write in first person. It prevents me overusing people’s names. Well, I say always. For the Watching trilogy I did. That’s actually the only time, but they’re the only books I’ve written that I believe to be any good ;) I mean, Beneath the Branches, Figurehead, the LORD books, and now The Quiet Ones, are all third person. But shh. I never said anything. I love first person. Isn’t it weird to look back at things you wrote when you were younger? I’m excited and nervous at the same time to dig back in the ancient archives to find the oldest thing I wrote. I’m sure it’ll be cringe-worthy. Thanks for participating in the chain! When I write in Microsoft Word, I always use something very plain and very simple. However, when I’m using ‘FocusWriter’ I have a background and some fancy font – I’ll only reformat it when I paste it into the main document anyway. I chose a font that works well in italics. That was a mistake, because now the novel I was writing at the time has loads of italics everywhere.! We all have to start somewhere. That’s correct. Wait till you see my first story. It’s way worse than yours. Mine is Probably the stupidest thing one could ever write… Oh well. Thanks for participating and nice post! Ha, well, my first STORY was some ridiculous thing in about year one at school, when I was five/six, but this is the first thing I wrote not in school, as far as I can remember. The ‘Papyrus’ font hurts my eyes. Then again, anything that’s not Calibri or Times New Roman does. However, when I was young and writing crappy stories just like you, I used to LOVE fancy fonts, only writing in them. I think they’re part of the reason I hate looking back on my work. And I too often look back at work (even fron just last year! ), and ask myself why I EVER thought that was even worth the ink it was printed on. It’s just… bad. And I know my writing will always be pretty bad, at least until I am able to look objectively at it. That’s why I’m really interested in taking a novel and revising it once a year totally, seeing how long it will take me until I’m totally happy with it. This post really hit home since I’m also participating in the blog chain and it’s a month to Nanowrimo. The first thing I ever wrote was a picture book when I was six that was horrible, and the first big thing I ever wrote was a novalla last year for Nanowrimo that was terrible. Seeing these two pieces reminded me that what I’m writing now is terrible, too. Sorry to overkill on the comment- I tend to do that. I’m Kirsten, by the way, or Kiki on the Internet, or GirlFromGlen, depending on where you find me. I love your blog, though, and I’m so glad I was able to find it through the chain! Thanks for commenting – hoping to see a few new faces via the chain! :D Yes, I hate looking back on my work. Well, mostly I do. Sometimes I find it quite amusing. Often I salvage random segments and reuse them … but shhh! Don’t tell! :) Usually I wasn’t allowed to print my stories, so they’re all on the computer or on floppy disk. (Yay, floppies!) So it’s not hard to change the font before I start reading. That is so cool that you still have the original manuscript! I always used odd fonts has well, but i never saved mine, or got past the 2nd chapter. Time to do serching through my computer’s recycle bin! Great post. Thanks for commenting :) Yes, the one on my desk isn’t the absolute original (that’s the one in the bin! Ha ha), but it’s a pretty old copy. I keep a lot of things, and throw a lot away. A lot of them are still on disk elsewhere, too. When I’m famous, our computer drawers will be worth a fortune. You’re welcome!! Yeah, I went searching for mine but couldn’t find it. Of course!! I hope you do! Third: The sentiments old works evoke are so amazing. Whenever I pick sometime up I write years ago, aide from being critical of how terrible I was at writing back then, it really make me feel like a kid again! Any misgivings go by-the-by, because like you said, that manuscript was the most amazing thing ever back then! (: awesome blog, I thought I was already following you! :O well, I am now! No worries on the typos. What are you on NaNo – have we talked a lot? I tend to be mainly in the Spork Room or the NaNoisms forum :D And thanks for commenting / following – I’m looking forward to seeing everyone else’s posts too. Possibly. Not sure how much I was there, though I know I ranted about my schedule in several different forums! And I’m a massive NaNoisms lover. I think it’s amazing that you had the patience to keep editing that! At that age, I would have given up after the first draft. Great post! Ha ha ha, we’ve all been there :) Your comment made me laugh! Ha Ha the fun part about using fancy fonts is when they don’t change over… For example I had one story where I changed the ‘note’ the character was reading into somethign that look all hand riting like. YOu should have seen me traying to translate if back from gobbldy gook year later when I moved from Wordperfect to Word 2003… Yeah that was a fun project. Saddly I don’t think I’ve imporved as much as you have Del/Miriam. Then again I doubt I’ve writeen nearly as much (or saved it all). Oh yes, the dreaded gobbledegook! Sometimes it’s just when you go to a new computer and don’t have the font, and you just end up with boxes. Great post, reminds me of several similar epics in the making, that I look back upon with a tad of embarassment. That said, there’s still salvagable ideas amidst some of them. Your names for instance are quite cool.